Higher education for DREAMers is crucial because we are a part of America — a big part, with nearly 800,000 of us who have received DACA. In order to contribute to the workforce in our shared country, we need to invest in and train individuals. We need people that are capable, skilled, and dedicated – qualities possessed by every single Dreamer I’ve ever met. All we need is the shot to prove how much we have to offer the country we call home. For me Arizona is, and always has been, my home. Mesa is the place where I learned to read and to ride a bike, where I lost my first tooth, and where I graduated high school. It is also the place where I see myself graduating law school, starting a family, and practicing as an attorney. I always knew my immigration status, but, when I was little, I didn’t pay it any thought. My parents bore the brunt of this weight, and they let me be a kid. I came to the United States with my parents when I was only seven. It was hard at first, since I didn’t speak English, but I picked up the language quickly and made friends. Then, my friends started studying for their driver’s licenses. And, I couldn’t. My friends started travelling. And, I couldn’t. My friends began working. And, I couldn’t. My friends began to apply to college, and I couldn’t. Personally, not going to college was never an option on the table. Even before DACA and before my scholarship, I knew I had to find a way. 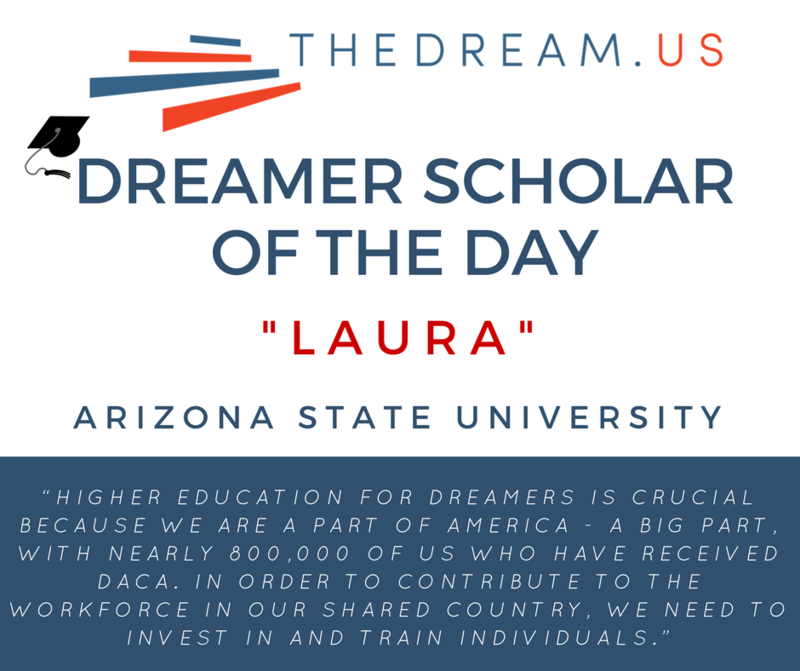 Thankfully, I was blessed to receive TheDream.US scholarship. College allowed me to emerge from my shell and embrace who I am as person. I ventured into my likes, my dislikes, and I confirmed my passion: law. My studies in the field of criminology/criminal justice have only propelled me towards my goal of serving my community as an attorney. DACA benefited me in more ways than I can ever explain. I am able to provide for myself, drive, and go to college. It gives me a stability, a foundation to build on. It’s everything to me.